Florence Nightingale (May 12, 1820 – August 13, 1910), who came to be known as The Lady with the Lamp, is the founder of modern nursing. In her day, battlefield nurses were regarded as hangers-on without any special skills. She helped create a profession that is both medically rigorous and imbued with a sense of vocation to he help the sick and injured. Nightingale has referred to her longing and subsequent career as a "calling from God." Her decision to undertake a career in nursing was contrary to her "station in society" and defied common sense. She initially tried to ignore her calling, but suffered deep anguish. Eventually she shook free of her family's expectations. She pursued her calling with selfless service. Sometimes her own health suffered, as when she served as a nurse during the Crimean War. She would gather data about hospital conditions and created ways to present the data to administrators and doctors, seeking to demonstrate how trained nurses had a contribution to make in the care of patients. This led to her recognition as a statistician. Many women and men who have chosen a career in nursing have followed Nightingale's footsteps, in their idealism, selfless service, and professional standards. Some people think that the identification of nursing as a woman's profession and of nurses as subservient to doctors—who have been mainly men—reinforces gender stereotypes. Nightingale cannot be blamed for this, as when she was active women were only just beginning to enter the medical profession. There is little doubt that her professionalizing of nursing has impacted positively upon the lives of millions of people, and opened up opportunities both to have a career and to exercise compassion and care. Nightingale was born to William Edward Shore Nightingale and Frances Smith Nightingale, a wealthy and well-connected British couple. Born at the Villa Colombaia in Florence, Italy, she was named after the city of her birth, as was her older sister (named Parthenope, the Greek name for the city of Naples). Nightingale made a commitment to nursing based on an inspiration she understood to be a divine calling first experienced in 1837 at the age of 17 at Embley Park in England. This sense of divine providence regarding nursing stayed with her throughout her life. Her decision to pursue this calling demonstrated a strong will on her part. It constituted a rebellion against the expected role for a woman of her status, which was to become an obedient wife. At the time, nursing was a career with a poor reputation, filled mostly by poorer women, "hangers-on" who followed the armies. These "nurses" were equally likely to function as cooks. Nightingale announced her decision to enter nursing to her family in 1845, evoking intense anger and distress from her family, particularly her mother. Nightingale was particularly concerned with the appalling conditions of medical care for the legions of the poor and indigent. In December 1844, she responded to a pauper's death in a workhouse infirmary in London. Her station helped her observations lead to what became a public scandal. This tragic death motivated her to become the leading advocate for improved medical care in the infirmaries. She immediately engaged the support of Charles Villiers (1852-1921), then president of the Poor Law Board. This led to her active role in the reform of the Poor Laws, which extended far beyond the provision of medical care. In 1846 she visited Kaiserswerth, Germany, a hospital pioneering quality patient care established by Theodor Fliedner (1800-1864), founder of the Lutheran Deaconess order, who managed the hospital. She was deeply impressed by the standards of medical care as well as the commitment and practices of the deaconesses at Kaiserswerth. This experience enlightened her further as to what was possible. Nightingale was courted for many years by politician and poet Richard Monckton Milnes, 1st Baron Houghton. After much agonizing, she finally rejected him, convinced that marriage would interfere with her ability to follow her calling to nursing. This decision again put her at odds with her mother. When in Rome in 1847, recovering from a mental breakdown, possibly precipitated by the continuing crisis she experienced regarding her relationship with Milnes, she met Sidney Herbert, 1st Baron Herbert of Lea, a brilliant politician who had been secretary at war (1845–1846) (a position he would hold again (1852–1854) during the Crimean War). Herbert was married, but he and Nightingale became life long close friends. Herbert was instrumental in facilitating Florence's pioneering work in Crimea and in the field of nursing. She became a key advisor to him in his political career. Nightingale's career in nursing began in earnest in 1851 when she received four months' training in Germany as a deaconess at Kaiserswerth. She undertook the training over strenuous family objections concerning the risks and social implications of her involvement. Her family also objected to the Catholic foundations of the hospital. While at Kaiserswerth, she reported having her most intense and compelling experience with the divine, regarding her calling. 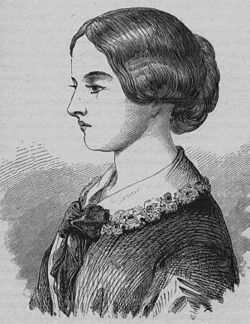 On August 12, 1853, Nightingale took a post as superintendent at the Institute for the Care of Sick Gentlewomen in Upper Harley Street, London. She held this position until October 1854. Her father had given her an annual income of £500 (roughly $50,000 in present terms) that allowed her to live comfortably and pursue her career. Nightingale's most famous contribution to healthcare came during the Crimean War. The war became her central focus when reports began to filter back to Britain about the horrific conditions for the wounded. On October 21, 1854, she trained a staff of 38 women volunteer nurses including her aunt Mai Smith. They were sent (under the authorization of Sidney Herbert) to Turkey, 545 kilometers across the Black Sea from Balaklava in the Crimea, where the main British camp was based. Nightingale arrived early in November 1854 in Scutari (modern-day Üsküdar in Istanbul). She and her nurses found wounded soldiers being badly cared for by overworked medical staff in the face of official indifference. Medicine was in short supply, hygiene was being neglected, and mass infections were common, many of them fatal. There was no equipment to process food for the patients. Nightingale and her colleagues began by thoroughly cleaning the hospital and equipment and reorganizing patient care. However, the death rate did not drop, but began to rise. The death count at Scutari was highest of all the hospitals in the region. During her first winter there, 4,077 soldiers died. Ten times more soldiers died from illnesses such as typhus, typhoid fever, cholera and dysentry, than from battle wounds. Conditions at the hospital were so fatal to the patients because of overcrowding, the hospital's defective sewers and a lack of ventilation. A sanitary commission was sent to the Scutari facility by the British government in March 1855, six months after Nightingale had arrived. The sewers were flushed out and improvements were made to ventilation. Death rates were dramatically reduced. Nightingale also suspected the high death rates were a result of poor nutrition and supplies as well as overwork. It was not until after she returned to Britain and began collecting evidence before the Royal Commission on the Health of the Army, that she came to understand that most of the soldiers at the hospital were killed by poor sanitary living conditions. This experience influenced her later career, when she advocated sanitary living conditions as a priority for hospitals. Through her advocacy and attention to the sanitary design of hospitals, she reduced deaths in the Army during peacetime. 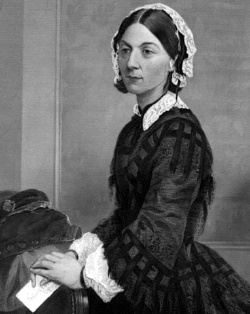 Florence Nightingale returned to Britain a heroine on August 7, 1857. According to the BBC, she was the most famous Victorian second only to Queen Victoria herself. Rather than live in the family home in Middle Claydon, Buckinghamshire, Nightingale moved to the Burlington Hotel in Piccadilly. However, she was stricken by a fever. Speculation was that the fever was possibly psychosomatic, or a delayed response to the stress of her work in the Crimean War and her bout with Crimean fever. She barred her mother and sister from her room and rarely left it. It has been suggested that she may have suffered from bipolar disorder. In response to an invitation from Queen Victoria, and despite the limitations of confinement to her room, Nightingale played the central role in the establishment of the Royal Commission on the Health of the Army. Sidney Herbert became chairman of the Commission. As a woman, Nightingale could not be appointed to the Royal Commission, but she was the author of the commission's report of over one thousand pages that included detailed statistical reports. She was also instrumental in the implementation of its recommendations. The report of the Royal Commission led to a major overhaul of army military care. It also led to the establishment of an Army Medical School and a comprehensive system of army medical records. 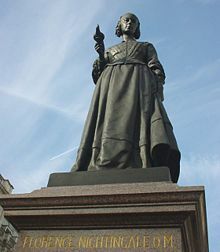 It has been suggested that Nightingale may have used her relationship with Queen Victoria to repress suggestions that Mary Seacole (1805–1881), another nurse working to treat the injured in Crimea, should be honored for her work. Unlike Nightingale, Seacole was actually based in the Crimea at Spring Hill, near Kadikoi, between Balaclava and Sevastopol. On November 29, 1855, while she was still in Turkey, a public meeting to give Nightingale recognition for her work in the war led to the establishment of the Nightingale Fund for the training of nurses. There was an outpouring of generous donations. Sidney Herbert served as the honorary secretary of the fund. The Duke of Cambridge was chairman. By 1859, Nightingale had £45,000 from the Nightingale Fund at her disposal to set up the Nightingale Training School. The school was established on July 9, 1860, at St. Thomas' Hospital. It is now called the Florence Nightingale School of Nursing and Midwifery and is part of King's College, London. The first trained Nightingale nurses began work at the Liverpool Workhouse Infirmary. Nightingale also campaigned and raised funds for the Royal Buckinghamshire Hospital in Aylesbury, near her family home. Nightingale wrote Notes on Nursing, which was published in 1860. It is a slim one 136-page book that served as the cornerstone of the curriculum at the Nightingale School and other nursing schools she established. Notes on Nursing also sold well to the general public and is still considered a classic introduction to nursing. During her bedridden years, she also pioneered in the field of hospital planning. Her work spread quickly across England and the world. Nightingale's work served as an inspiration for nurses in the American Civil War. The Union government approached her for advice in organizing field medicine. Although her ideas met official resistance, they inspired the volunteer body of the United States Sanitary Commission. In 1869, Nightingale and Elizabeth Blackwell (1821-1910) opened the Women's Medical College in England. Dr. Blackwell became the first woman medical practitioner in the United States. By 1882 Nightingale nurses had a growing and influential presence in the embryonic nursing profession. Some had become matrons at several leading hospitals, including, in London (St. Mary's Hospital, Westminster Hospital, St. Marylebone Workhouse Infirmary and the Hospital for Incurables at Putney), throughout Britain (Royal Victoria Hospital, Netley; Edinburgh Royal Infirmary; Cumberland Infirmary), Liverpool Royal Infirmary as well as at Sydney Hospital, in New South Wales, Australia. Beginning in 1896 Nightingale was not able to leave her bed. She died on August 13, 1910. The offer of burial in Westminster Abbey was declined by her relatives. She is buried in the family plot in the graveyard at St. Margaret Church in East Wellow, England. Nightingale exhibited a gift for mathematics from an early age. She excelled in the subject under the tutorship of her father. Her special interest was in statistics, a field in which her father was an expert. She was a pioneer in the nascent field of epidemiology. Her reports made extensive use of statistical analysis through her compilation, analysis and presentation of statistics on medical care and public health. During the Crimean War, Nightingale invented a diagram she called the coxcomb or polar area chart—equivalent to a modern circular histogram or rose diagram —to illustrate seasonal sources of patient mortality in the military field hospital she managed. These were essentially the first contributions to circular statistics. She made extensive use of the coxcomb to present reports on the nature and magnitude of the conditions of medical care in the Crimean War to Members of Parliament and civil servants who would have been unlikely to read or understand traditional statistical reports. As such, she was a pioneer in the visual presentation of information, also called information graphics, and has earned high respect in the field of information ecology. In her later life Nightingale made a comprehensive statistical study of sanitation in Indian rural life. She was the leading figure in the introduction of improved medical care and public health service in India. Nightingale's lasting contribution has been her role in founding and setting high standards for the nursing profession. She set an optimum example for nurses everywhere of compassion, commitment to patient care, as well as diligent and thoughtful hospital administration. There are three hospitals in Istanbul named after Nightingale: F. N. Hastanesi in Şişli, (the largest private hospital in Turkey, Metropolitan F. N. Hastanesi in Gayrettepe and Avrupa F. N. Hastanesi in Mecidiyeköy, all belonging to the Turkish Cardiology Foundation. Nightingale's stellar example inspired many U.S. Army nurses during the Vietnam War, sparking a renewal of interest in her life and work. Her admirers include Country Joe McDonald of Country Joe and the Fish, who has assembled an extensive web site in her honor. The Agostino Gemelli Medical Centre in Rome, the first university based hospital in Italy and one of its most respected medical centers, honored Nightingale's contribution to the nursing profession by giving the name "Bedside Florence" to a wireless computer system it has developed to assist nursing. In 1858 Nightingale was elected the first female member of the Royal Statistical Society and she later became an honorary member of the American Statistical Association. Nightingale was awarded the Royal Red Cross by Queen Victoria in 1883. In 1907 she became the first woman to be awarded the Order of Merit. In 1908 she was given the Honorary Freedom of the City of London. ↑ For further reading on the topic of Nightingale and Seacole see History Today 55 (2). ↑ Country Joe McDonald’s Florence Nightingale Tribute. Retrieved June 14, 2007. This page was last modified on 13 April 2017, at 15:19.